How to Move HTC Phone Data to iPad? Home > Resources > Transfer > How to Move HTC Phone Data to iPad? iPad is undoubtedly the most popular tablet worldwide, with which you can watch movies, listen to music and play games on it at will. If you are an HTC phone owner and now you have a brand new iPad Pro, you may wish to enjoy your precious media files on the new gadget for entertainment. However, HTC phone and iPad are running different operating system and it seems difficult to do that. Don't panic! We will introduce a powerful transfer tool to achieve it. Here is an almighty HTC to iPad data transfer tool named the Coolmuster Mobile Transfer, which makes it pretty easy for you to transfer contacts, SMS, photos, videos, music and apps from HTC One M10/M9/M8 to iPad Pro/Air/4/mini, and the other way around. 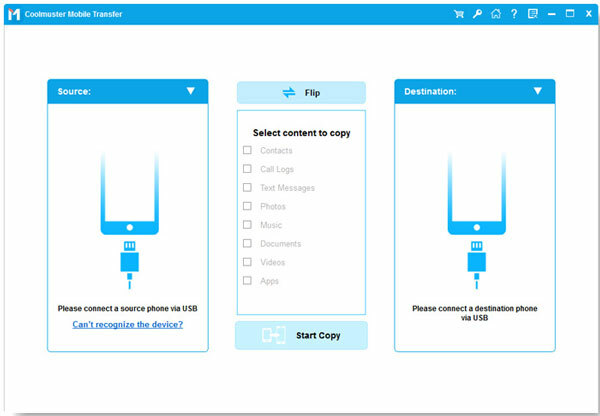 It also enables you to transfer data from mobile phone to computer for backup, and restore your phone from the backup file with one click. It supports almost all Android, iOS and Symbian devices. As I mentioned on the above, Coolmuster Mobile Transfer offers you with free trial version. Just free download the tool via the buttons below and then refer to the detailed tutorial to see how to move HTC data to iPad. First of all, download and install the recommended HTC to iPad transfer program - Coolmuster Mobile Transfer on your computer. Launch it and connect your iPad and HTC phone to the computer with two USB cables. Click "Phone to Phone Transfer" -> "Start" on the primary window to enter the phone to phone transferring window. The program will detect both of your connected HTC phone and iPad and show them side by side. 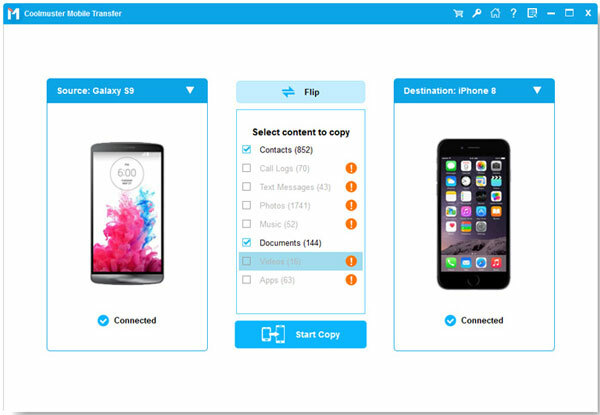 Finally, you can choose the data you want to transfer between the two phones, such as contacts, text messages, photos, videos, music, apps, etc. Then, click the left or right arrow in the middle to begin the data transfer from HTC to iPad.